Hee. Flavono. But of course I had to pick this up because…Flavono! Also, this appears to be another in the Lotte gum series in which we have previously met Black Black. 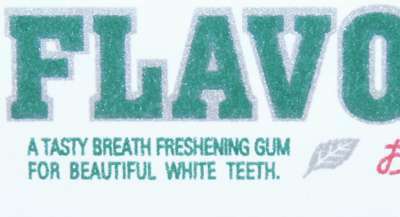 I see it as sort of Lotte’s answer to the Wrigley family and speaking of Wrigley, Flavono could really easily be their spearmint counterpart. 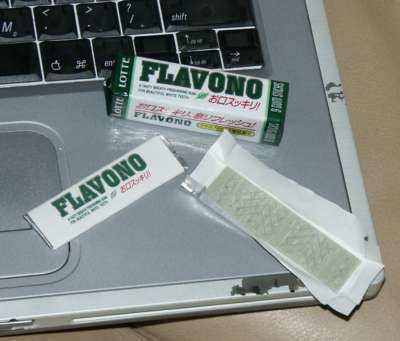 The gum is about the same shape, more or less (maybe a bit shorter and slightly fatter like someone grabbed the edges of a Wrigley gum in Photoshop and messed with the margins just a wee bit) but instead of a drab whitish gray, Flavono is green. I’ll have to give it to the Lotte gums; (so far) they’ve been pretty colorful. They have also been pretty nasty, albeit we’re working with a pretty small sampling size of one. The nice thing about such a miniscule collection of data point is that if you get another, it could radically change the results. Thus, it makes me happy to report that Flavono doesn’t continue the Black Black blech trend. Flavono is nicely minty and just a touch menthol-y once you chew the stick down to a nice blob of gum. I’m not sure if all Asian gum needs to have some sort of mentholated, seeings as I’ve only really tried three company’s products, but they all had that tingly mouth aspect on top of the gum flavor. Flavono’s menthol-y isn’t as Sucrets like as Black Black was and the flavor lasted perhaps a touch longer. It was no Xylish half hour chew, but the Flavono gum blobit, which I was chewing for about a half hour, never stiffened up or got stringy or in any way changed texture. It was a nice soft gum chew the entire time. Go Flavono. Rating of 3.5 wasabi peas out of 5 will do nicely. is it halal ? my friend said its non halal. i was confused.